HAPPY 2014. 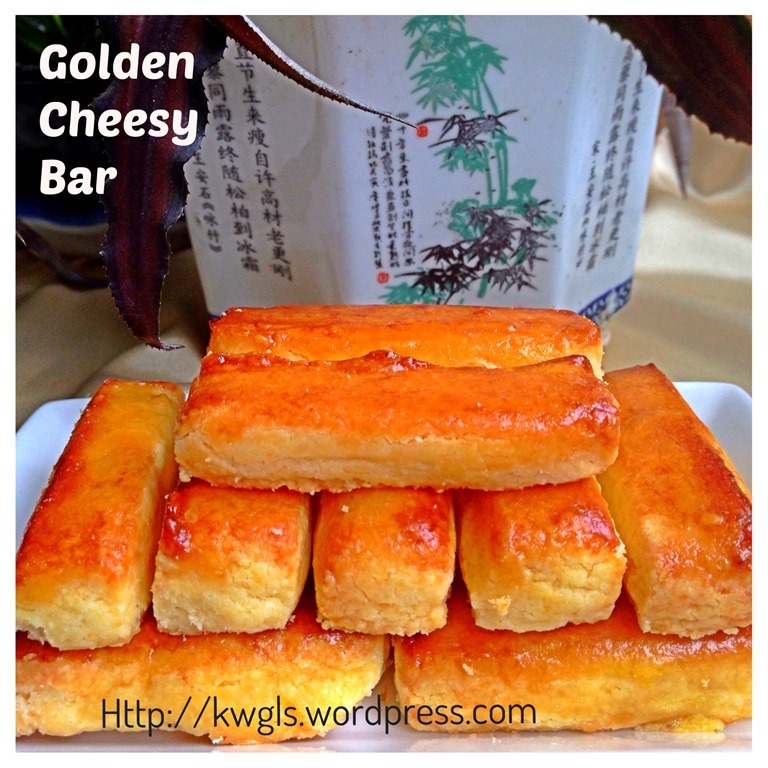 This is my second post of 2014 and will be my officially first post with recipe this year. 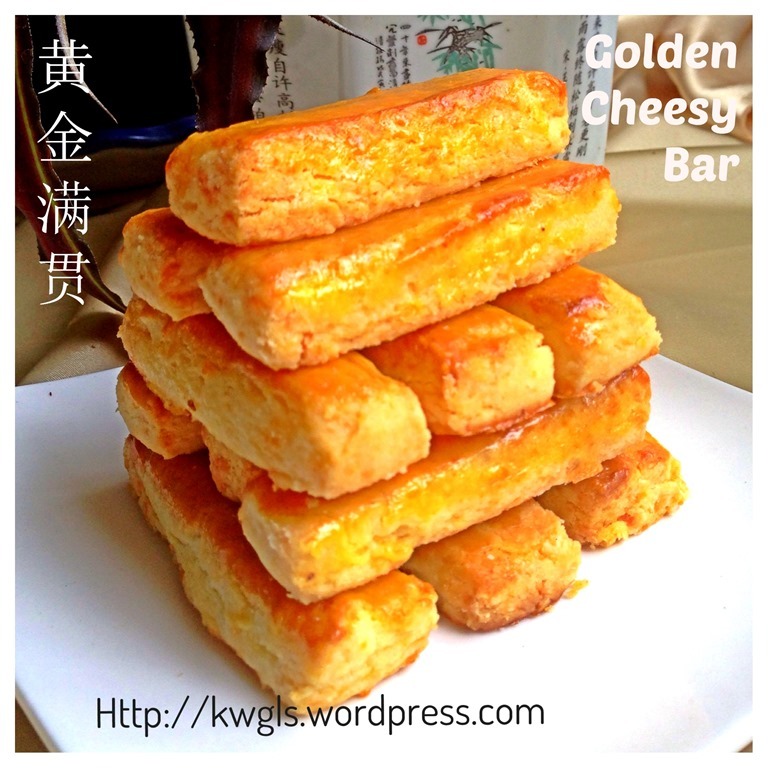 The first post was issued yesterday on my top 16 posts last year and you may want to check it out on Guaishushu’s Report Card–Top 16 posts For 2013. I sincerely hope that 2014 will be a year that all readers will be blessed with lots of wealth. 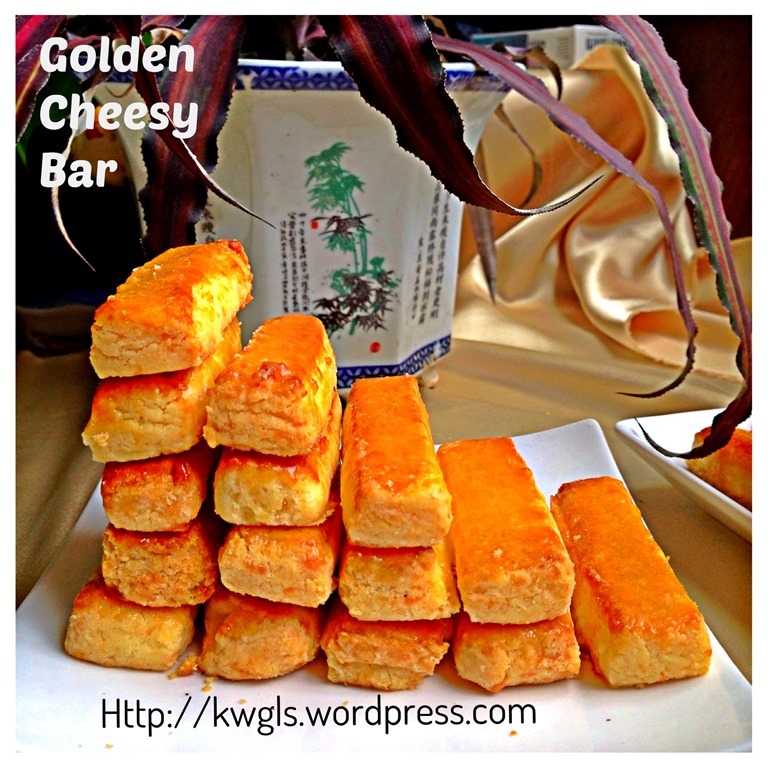 To have an auspicious start, I will share with reader this recipe of golden cheesy bar. I knew that some of the Facebook Group members are awaiting for my post so that they can prepare this for the coming Chinese New Year. 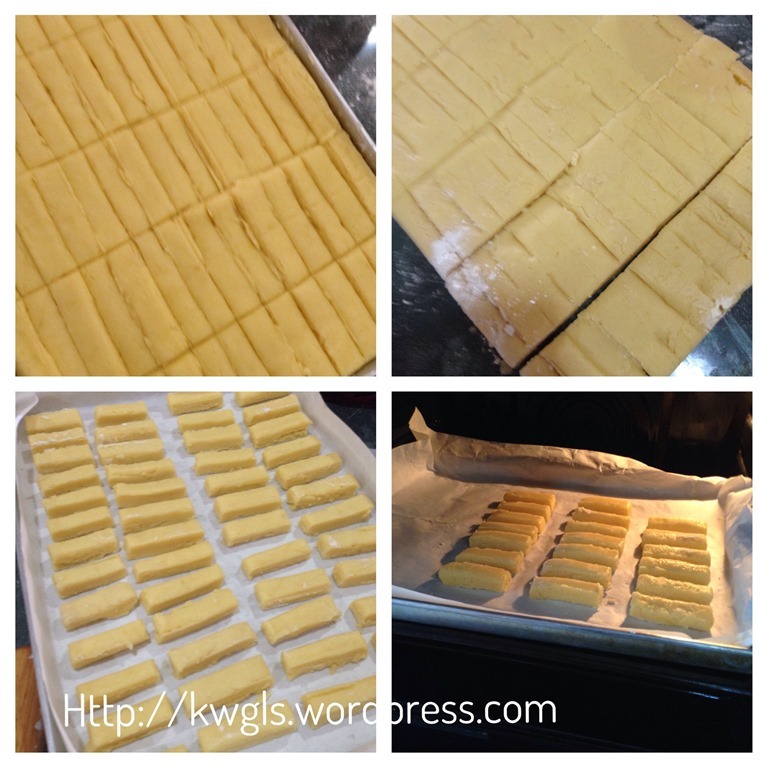 This is one type of savoury cookies that is rather common in Sarawak and Indonesia. However, I am unsure if it is common in Singapore and West Malaysia. 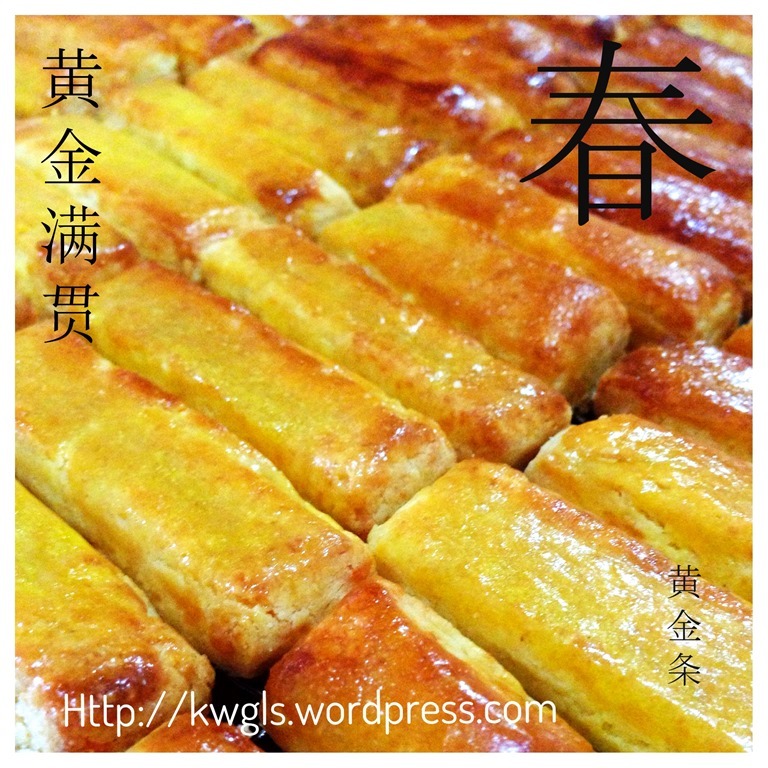 During Chinese New Year, most families will serve their guests with sweet cookies such as pineapple tarts, kueh lapis and etc. Our visiting to relatives and friends house can be as many as 10 families per day. After having too much sweet treats, logically, my body will crave for something savoury, this is the cookie that I have always looking for in a serving tray of many cookies. This cookie is very common in Indonesia possibly due to the Dutch colonization. 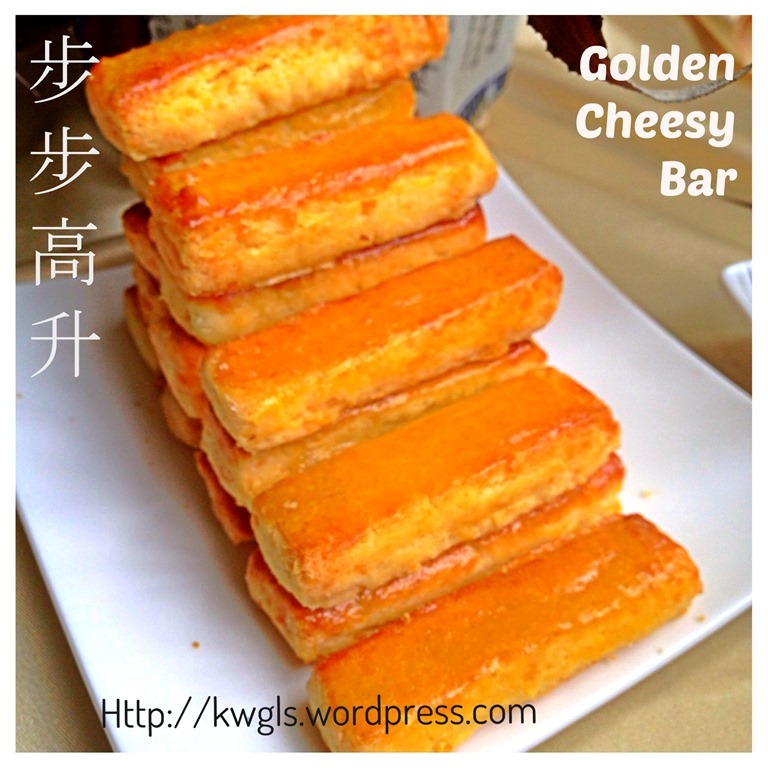 It is made of Edam Cheese, cheddar cheese and other savoury items but not even a grain of sugar. Instead, chicken or beef stock powder were used. It is called Kaasstengels (a Dutch name) in Indonesia. If you Google kaasstengels, the Dutch version is made using puff pastry which is rather different from the Indonesian version of kaasstengels. For more detail read up of Kaasstengels, you may want to refer to http://id.wikipedia.org/wiki/Kaasstengels. 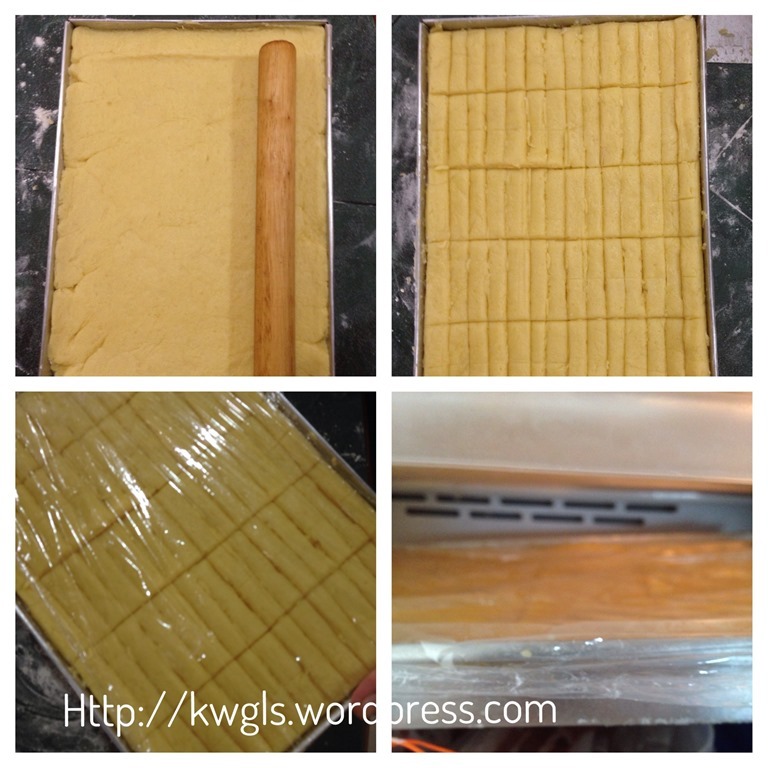 I got this recipe from one of my Google Plus friends – Ms. Karin Frauenfeld . 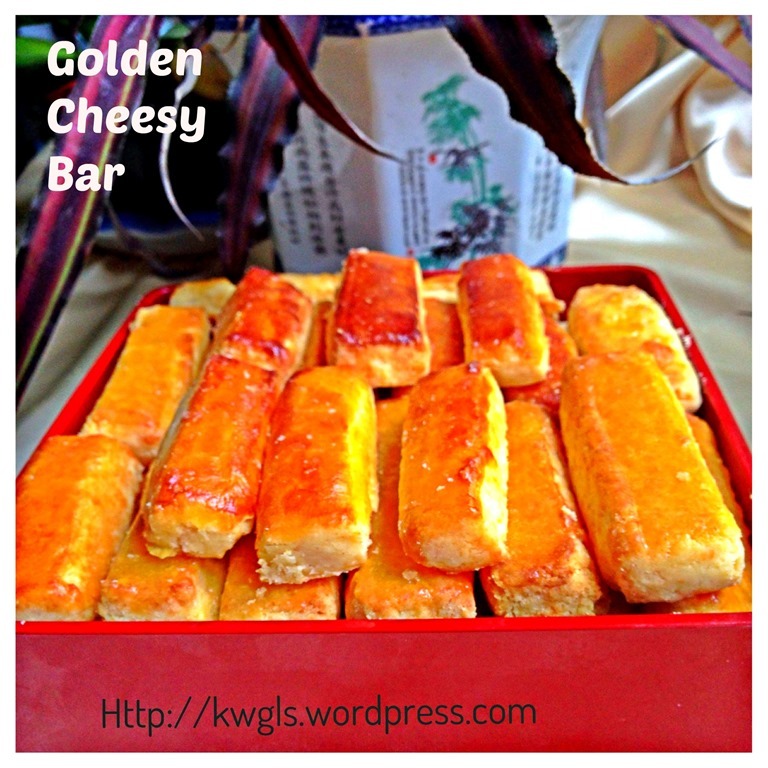 She had posted this recipe in our Goggle plus community and have a very good account on the history and some tips of making these savoury cheese stick HERE. 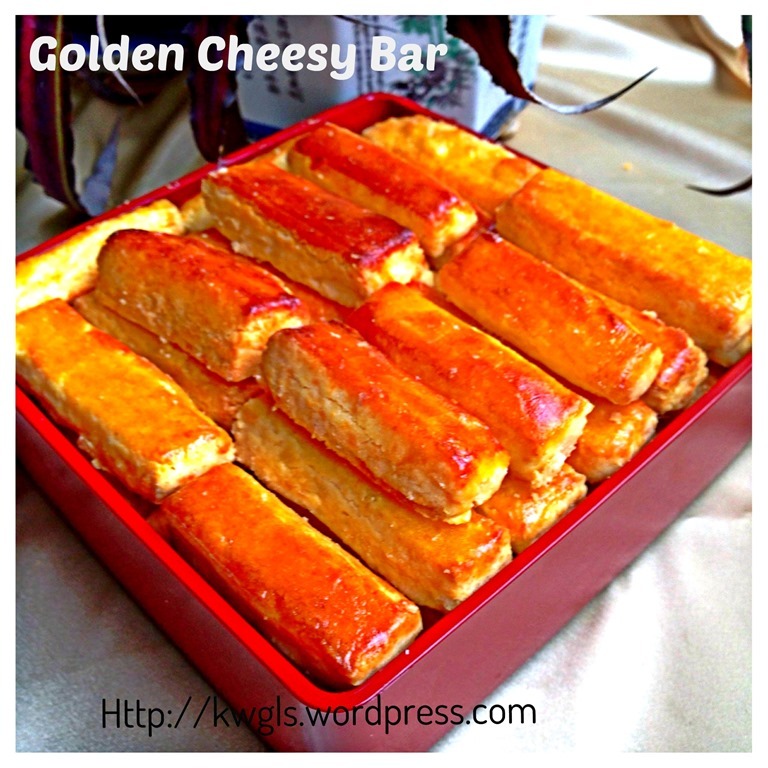 For more detail instruction, please show support to her by visiting her blog in Indonesian Savoury Cheese Stick. * Note: you can get most Edam Cheese in supermarket Cheese Sections. Pre-heat oven to 160 degree Celsius and line two baking trays with parchment paper. 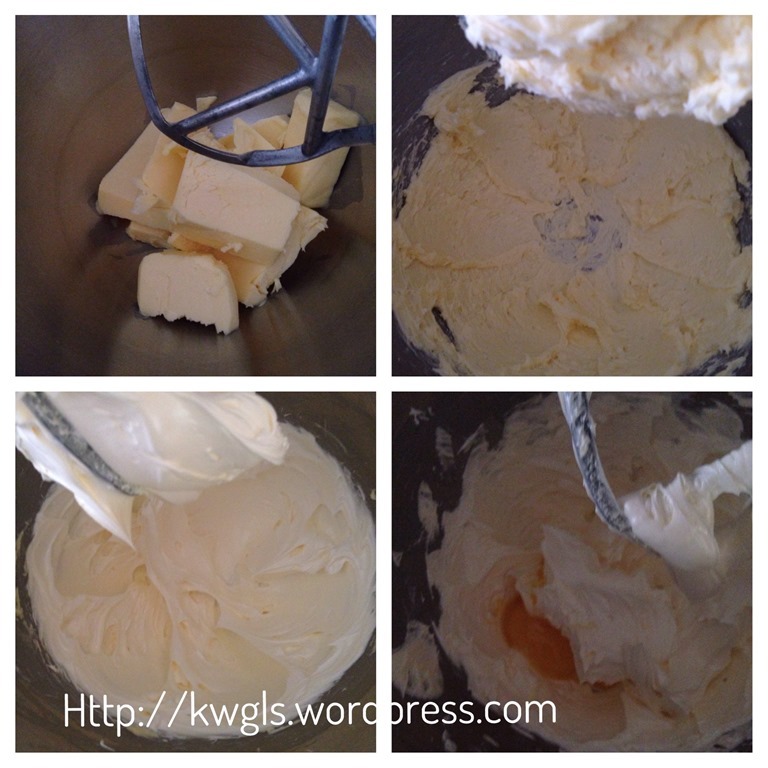 Cream the butter until light and fluffy. Add in one egg yolk at a time. Stir until well mixed. Sift in all the dry powdery ingredients (milk powder, chicken broth powder, plain flour and corn starch). 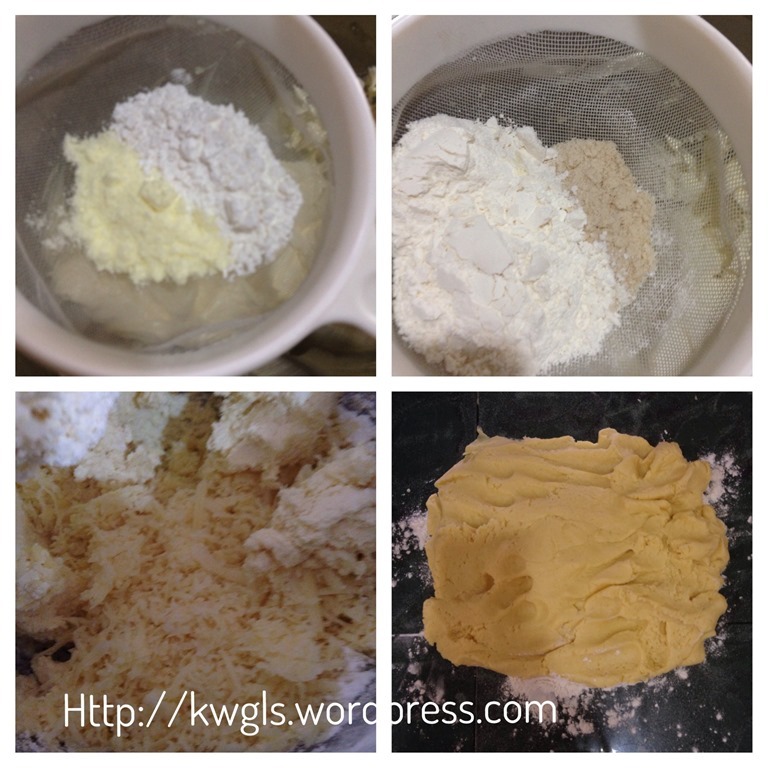 Use the mixer to stir at low speed until well mixed. Add in grated cheeses (Edam cheeses and cheddar cheeses), stir until well mixed. Transfer out to a flat surface. Use hand to knead for 1-2 minutes until well combined. Roll the dough into a 1.5 cm thick and cut into 1.5cm x 1.5 cm x 4 cm. In order to ensure consistent size, you can consider to press your dough into a Swiss roll baking tin, use a ruler to cut, chill it in the freezer for 5 minutes. Take out, follow the line to recut and transfer to the baking tray lined with parchment paper. 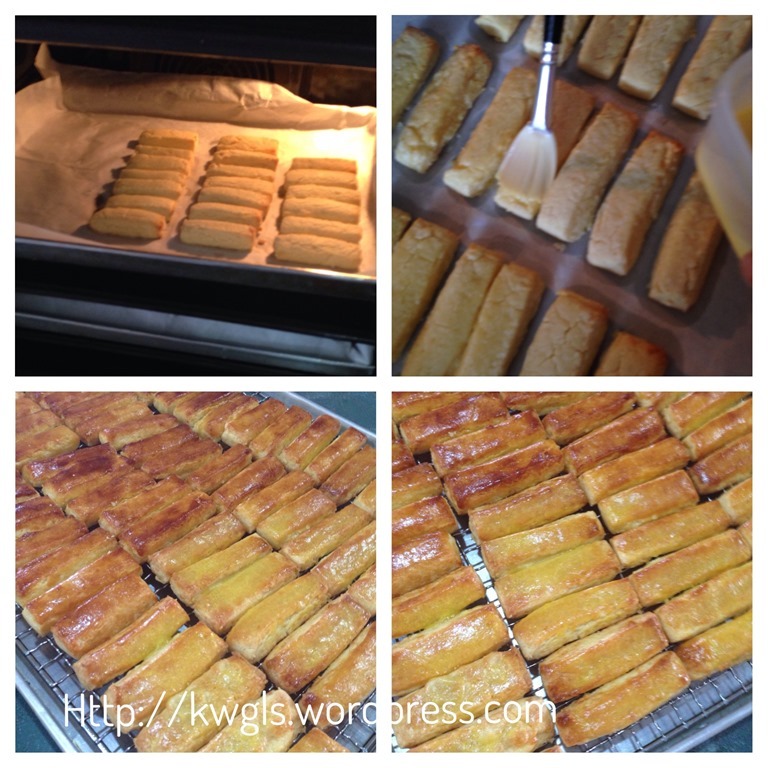 Bake in the preheated oven of 160 degree for 15-20 minutes. After 15 minutes, egg wash the cookies thoroughly. It is ok if the cookies have a bit of crack but please be careful as it can be quite fragile when hot. When you see the crack, egg wash that portion with more egg mixtures. If you want it to be golden brownish and shining, you have to keep an eye on the cookies and egg wash additional one to two times if necessary. I have to thank Ms. Karin for providing this recipe. Do pay a visit to her blog at http://karinisafrauenfeld.blogspot.de for some points that were not mentioned in this post. This is an auspicious cookie and hope you like the post today. Cheers and have a nice day. 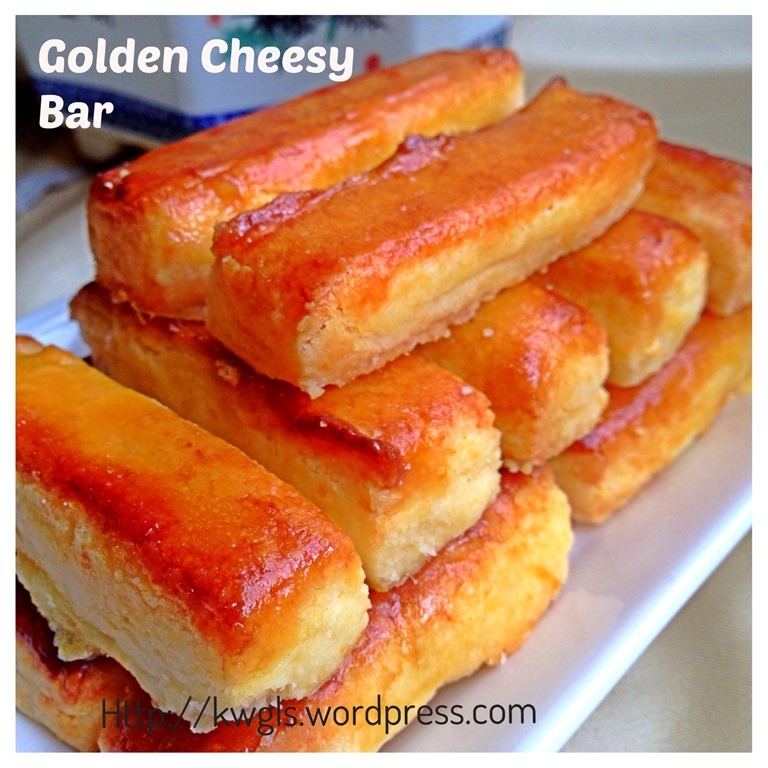 For more recipes, you can refer to my RECIPE INDEX here and you can follow me at PINTERESTor visit this blog’s FACEBOOK PAGE . 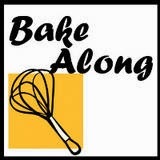 Here i am baking Chinese New Year cookies along with Lena, Joyce and zoe, the linky will be opened till Jan27. 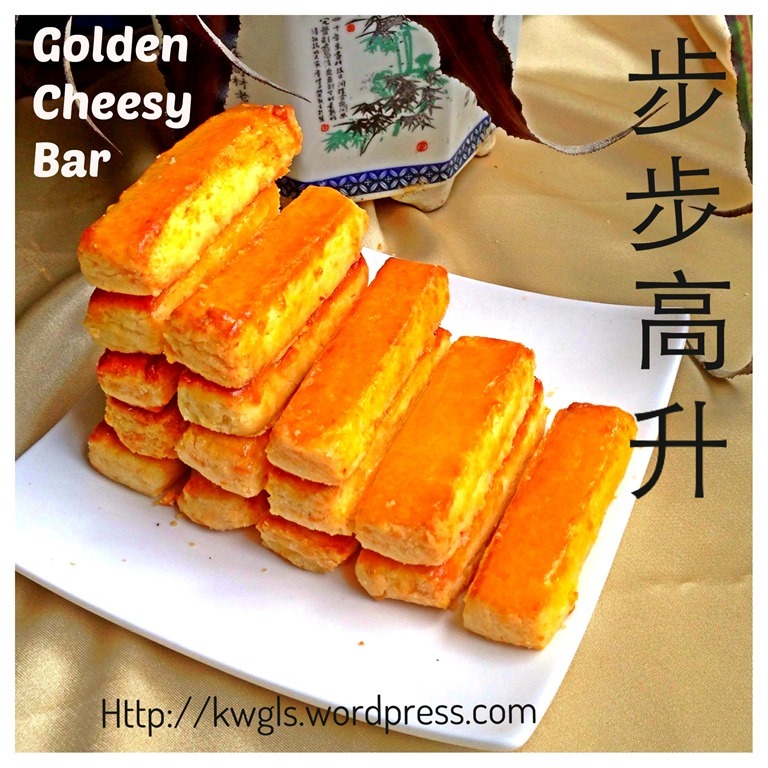 This entry was posted in Cakes and cookies, Chinese New Year 2014, Food Preparation Series and tagged 8, 黄金芝士条， 黄金条， kastengel, golden cheesy Bar, GUAI SHU SHU, Guaishushu, postaday, savory cheese stick cookies. Bookmark the permalink. this is gorgeous! really should have this around the house for CNY! huat ah! 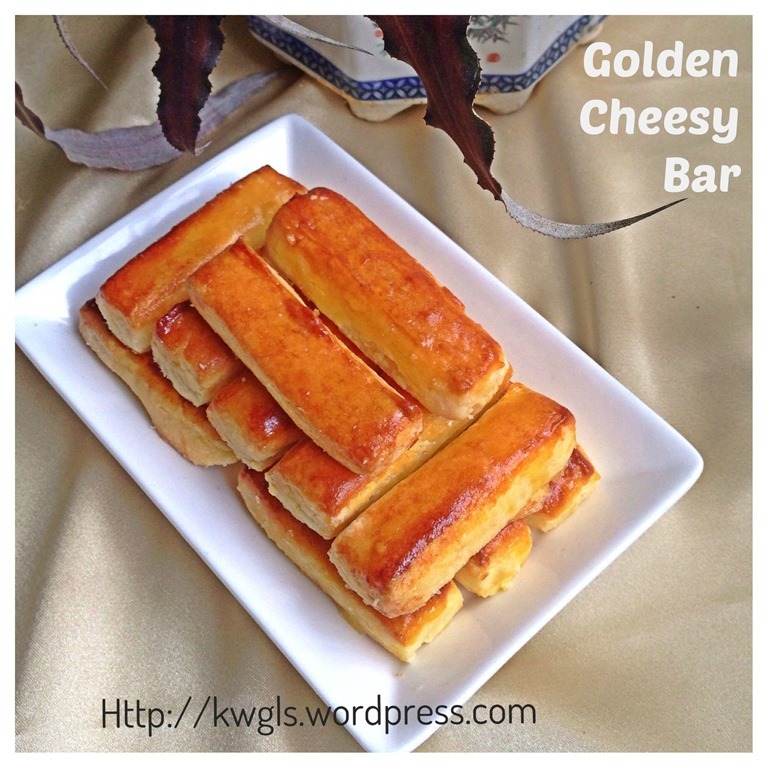 Love the idea of a savory cookie, especially one with cheese 🙂 Thanks for posting! Great recipe you’ve got there! What would be the best substitute for Cheddar and Edam cheese? I don’t think I have seen them here in the local markets. Thanks! You can all use gouda cheese. Edam cheese is very expensive here. so we use partly cheddar cheese. Gouda cheeses will defiitely give better taste than the other two cheeses. This looks delicious. I love the story/history behind it. The savory cookie/cake is a nice addition to a buffet table. Wow, these look really delicious! Thanks for sharing the recipe! Looks amazing. Possibly beyond my culinary capablities, but I will look out for them for Chinese New Year. Dropping in from #recipeoftheweek. This is really interesting, I live in the dutch-speaking part of Belgium, near the dutch border. I should ask my dutch friends if they have heard of kaasstengels. Great that I can use gouda cheese to replace edam cheese which I have never heard of. Thanks for sharing! Welcome. The kaasstengel in holland is puff type of pastry unlike here. 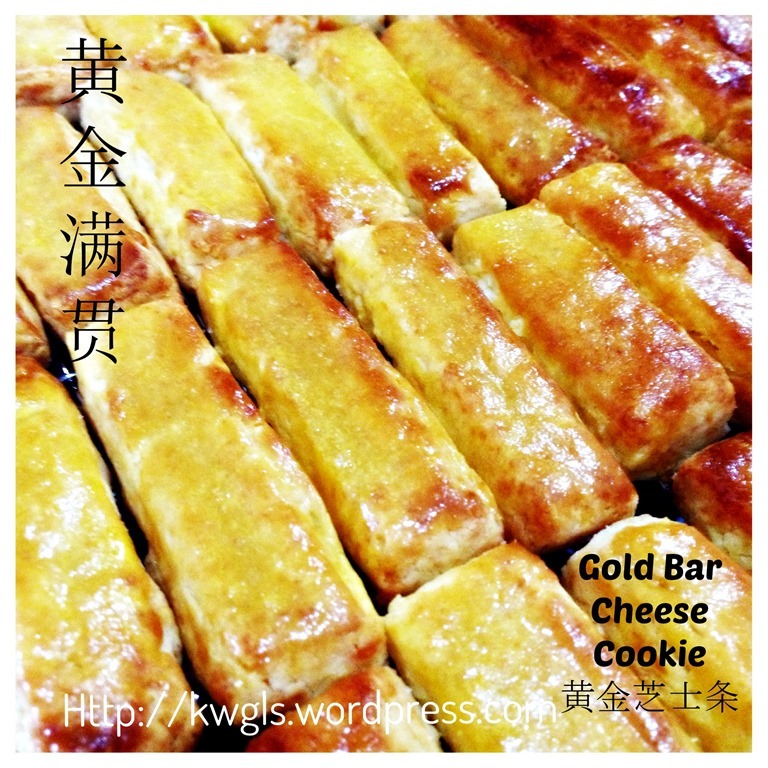 they are indeed look like gold bars..how nice if they were real…haha.. i hvnot heard of kaasstengels and dont think i hv come across this at my place here.. and am delighted to know about this cookie…thx! Welcome. This is a nice cookie and stands out in a tray of sweet cookies..
Can I use concentrated chicken stock instead as I do not have the powdered type? 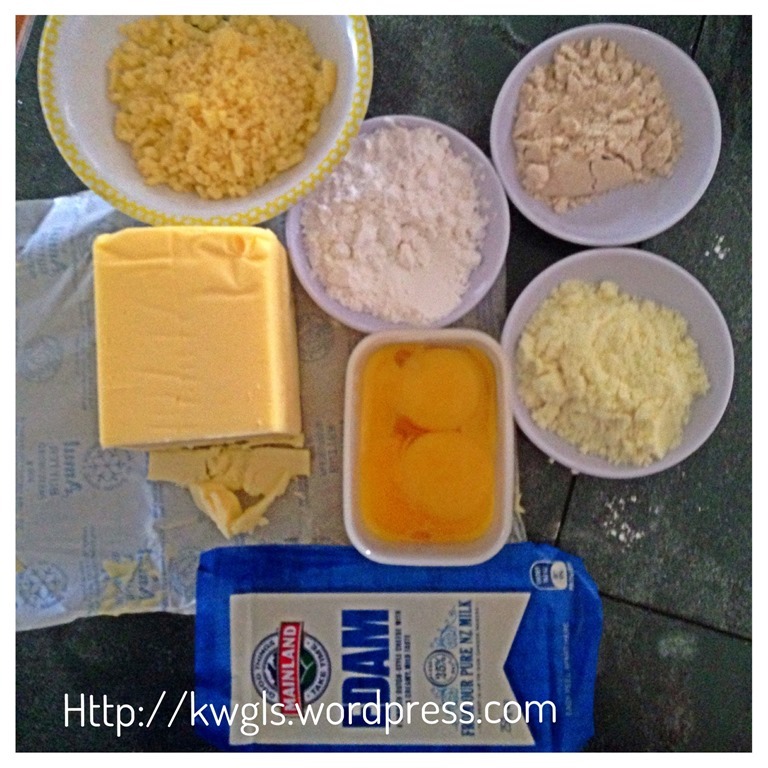 Can i deduct the total amount of the cheese from recipe above? Say like, from 375gr to 250gr? Will it change the texture of the dough? Some people in the house just not too keen on having too much cheese.. I honestly believe you can..